Politics endangers the soul. Where there was once principle and conviction, there is compromise and obfuscation. Doctrine adapts and morality is murky. Truth is abstracted, or swallowed in bitterness. The essential decency of our national worship is mistaken for for zealous intolerance: it is extremely unadvisable to believe anything too strongly. Since becoming leader of the Labour Party, Jeremy Corbyn has bent over backwards to dispel the perception that he believes what he once seemed to. Observations that he breaks bread with Jew-hating anti-Semites, conspiracy theorists, murderers, Israel-haters, Holocaust-deniers and sundry other terrorists and extremists have been dispatched with a shallow repudiation: the diplomatic quest for peace and reconciliation. He is no racist: he once enjoyed fellowship with cultic terrorists in the pursuit of social justice and community cohesion, but will be a bit more careful in the future because he wants to be prime minister. Dr. Zomlot served as a PLO representative to the UK from 2003 to 2008. His work experience includes the United Nations, the London School of Economics and the Palestine Economic Policy Research Institute. He holds a PhD degree in Economics from the University of London and held teaching and research positions at the University of London and Harvard University. His book entitled: ‘Building a Palestinian State Under Occupation’ is in press. 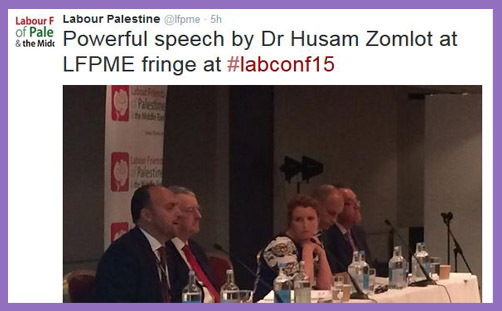 Why are the Labour Friends of Palestine hosting a conspiracy theorist and Holocaust-denier? Why are they hosting someone to speak about Palestinian justice and history whose apprehension of justice is vicious, and whose knowledge of history is.. well, a little confused. There is always the danger of oversimplifying perplexing prophetic oracles by sprinkling them with assertions of sufficiency and self-authentication, but Dr Husam Zomlot is so zealous in his loathing of Israel that biblical history has to bend to his presuppositions and prejudices. Instead of beginning with rational accounts of history, he precludes them by asserting ahistorical nonsense. Surely, on the edgy matter of the existence of Israel, “if we go back to the biblical times and the biblical explanations”, we must begin with Abraham and notions of election in Genesis; or Moses and the Deuteronomic leitmotif of the promised land? The Covenant is Old Testament: God chose a people and made promises to Israel. God’s treaty with Israel is binding, fulfilling and salvific. Most scholars date the book of Genesis to between 5th-6th centuries BC, and Deuteronomy between 7th-8th centuries BC, though it undoubtedly contains much earlier material. But Dr Zomlot, with his superior academic grasp of the ‘Book of the law’ and the levitical traditions of Israel’s late monarchical period, seeks to “go even further and go back to the Roman time” to examine the cultural, geographic, linguistic and religious origins of Israel. 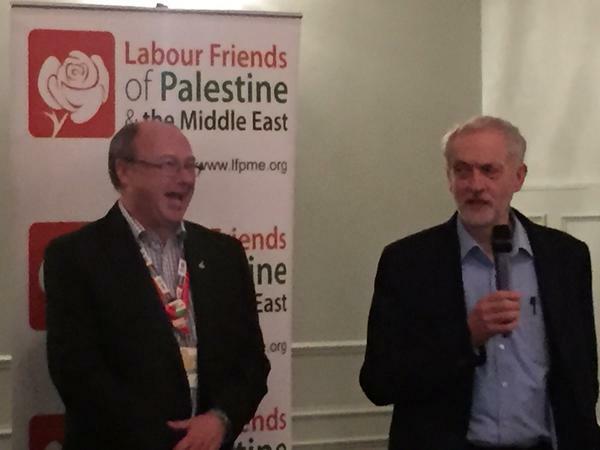 Jeremy Corbyn graced Labour Friends of Palestine with his presence. The meeting was packed, and Dr Zomlot was lauded for his passionate speech. But it is an eccentric scholar indeed who situates “the Roman time” before “the biblical times” by which the moral nature of the people of Abraham, Isaac and Jacob were entrusted by Yahweh to demonstrate righteousness and justice and bless all nations. Eccentric, or an anti-Semitic, unethical, duplicitous, Israel-hating conspiracy theorist. Why are Labour Friends of Palestine giving a platform to such extremists?